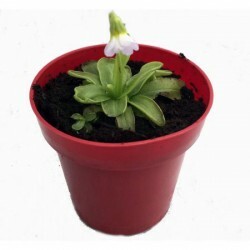 Butterwort (Pinguicula primuliflora) - 3"
Butterworts have sticky adhesive leaves which attract, capture and digest insects in order to supply the plant with nutrients such as nitrogen not found in the nutrient poor, acidic soil that it grows in. 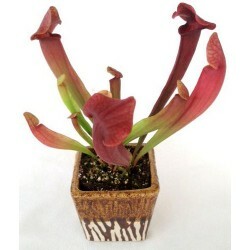 Size: 3"
Pitcher Plant - Cobra Nest (Sarracenia x hybrida) - 3"
Pitcher plants "eat" insects by luring them into a specialized, cylindrical leaf (the pitcher) using a combination of nectar, sweet scent, and conspicuous coloration. 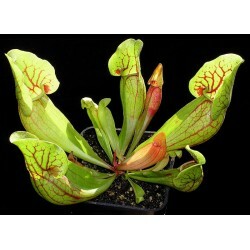 The pitcher is an amazing structure that is able to catch insects with no moving parts. 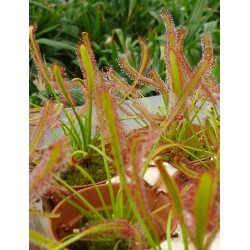 Size: 3"
Purple Pitcher Plant (Sarracenia purpurea) - 3"
Sundew - Octopus Plant (Drosera ssp.) - 3"
Octopus Plants (aka Sundews) get their name from their tentacled leaves, each with hundreds or moist droplets that appear as water to flying insects but instead are glue! 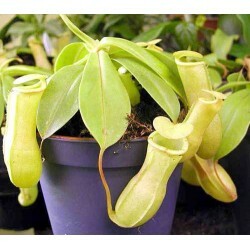 Size: 3"
Tropical Pitcher Plant (Nepenthes x hybrid) - 3"
Tropical Pitcher Plants (Nepenthes sp.) aka Monkey Cups, are tropical plants native to parts of South East Asia, India, Madagascar and Australia. Most are vines, but some remain compact in habit. The name "Monkey Cups" comes from monkeys occasionally drinking the fluid in the pitchers. Size: 3"
Venus Flytrap (Dionaea muscipula) - 3"
The Venus Fly Trap (Dionaea muscipula) is the most well known species of carnivorous plants. These insectivorous plants lure their prey using a sweet smelling nectar. When an insect lands on the head of the fly trap, they seek the source of the nectar, and if the plant is lucky, it will touch one of the many trigger hairs located within the jaws of the trap. Size: 3"